Warthog’s appearance is familiar to everyone, even those who don’t care for natural history, thanks to Disney’s Pumbaa character from The Lion King franchise. The species is widespread throughout Africa from Ethiopia, Burkina Faso and Cameroon to Namibia, Mozambique and South Africa, and in fact you can hunt warthog in every country in Trans-Saharan Africa where big-game hunting is legal at all. Warthog is one of the most affordable animals to hunt in Africa, and the shooting fee can be as low as $300-$400. However, few hunters travel as far as Africa to hunt only the Warthog. It is usually included in a “plains game” package along with other popular species as impala, springbok, etc; the price of such packages usually starts at $2,000, and goes into $3,000-$7,000 range, depending on number of days and species. What will the bottom line of my African safari be? It’s not always easy to answer this question, and many beginners are confused by daily rates, trophy fees, and package deals. And what about other expenses, such as tips, travel and taxidermy? Nobody but you can answer this question, but this blog post will help. Opportunities to hunt Warthog exist pretty much the year round, especially on game farms. No month is necessarily better or worse for Warthog hunting, especially given the wide distribution of the species, but most people prefer to schedule their plains game hunts for the Southern Hemisphere winter, that is, June to October. Most plains game hunts in Africa are spot-and-stalk, and if the hunter and the PH spot a good warthog, they might as well try and stalk it. But the most popular, and probably most reliable method of Warthog hunting is from a blind or tree stand over a waterhole. This is the method preferred by bowhunters. If you haven’t ever hunted any members of the pig family before, take your time to learn their anatomy and the best shot placement, as the porcines’ vitals are located in slightly different places than with deer. You don’t become one of the top five most popular species to hunt in South Africa for nothing. Affordable prices, wide distribution, and Walt Disney Studios are only a few of the reasons for the popularity of Warthog. The beast itself is striking, with its dare-devil looks, fly-whisk tail, and enormous tasks, every aspect of the Warthog just screams “Africa!”. These tusks aren’t ornamental either, so be careful when approaching a wounded Warthog. And waiting in a blind over a waterhole, with the unlimited opportunities to observe the African wildlife, is in itself an experience not to be missed! 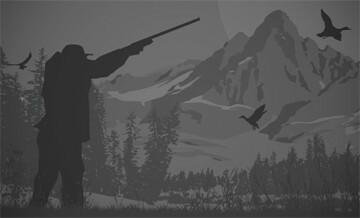 The family operation offers plains game hunting in their privately owned hunting territory. The hunt requires at least 7 days for one bow hunter. We are dedicated to fair chase hunting.